Space Discovery: 36 Light-Years Away, the Most Earthlike World Yet? From the very start of the modern planet-hunting era a decade and a half ago, the pioneers in this astronomical subspecialty were up front about saying it wasn't about astronomy; it was about biology. Their colleagues might be happy probing to the edge of the cosmos looking for exotic things like black holes and quasars and dark matter. But the planet hunters were ultimately looking for life on distant worlds. Assuming they were talking about earthlike life  which they were, since it's the only kind we understand  the target planets would have to be earthlike too. That meant they'd have to be about the same size as our home world, orbiting their parent star at about the right distance for water to exist in liquid, life-nurturing form. The eureka moment hasn't come yet, but an announcement yesterday makes it clear that it's getting awfully close. Speaking at the Extreme Solar Systems II conference in Jackson Hole, Wyo., a team of European scientists revealed the discovery of no fewer than 50 new worlds. Sixteen of them are so-called superearths, only a few times more massive than our own world. And one of them, known as HD 85512 b, circling a star about 36 light-years away in the constellation Vela, is sitting just inside its sun's habitable zone. "It's a beautiful detection," says Berkeley's Geoff Marcy, who leads a different team of planet hunters. "And it's plausible that it could be habitable." Plausible is the best anyone can say for now. A firmer answer will have to await a new generation of powerful telescopes that are under construction or still on the drawing board. If the answer turns out to be yes, the question of whether 85512 b actually is home to life will depend on all sorts of factors. What's the mix of heat-trapping greenhouse gases in the atmosphere? Does 85512 b have any water to start with? Does it even have a solid, rocky surface on which life can gain a foothold, or is it like a mini-Neptune, with a kernel of solid stuff at its core and the rest mostly swirling gases? Nobody knows. Indeed, it would be an improbable bit of luck if this particular world did happen to have all the right stuff for life, since so many ingredients and conditions have to fall in line. The new world is still a big deal, though, because it's confirmation that astronomers now have the technology to find planets in the life-friendly ballpark in droves. In fact, they have several technologies. Most of the big planet announcements over the past year or two have come from the Kepler space mission, which looks for the slight dimming as a planet passes in front of its star. But the 50 new planets announced in Wyoming were discovered from the ground with a device called the High Accuracy Radial velocity Planet Searcher, or HARPS. 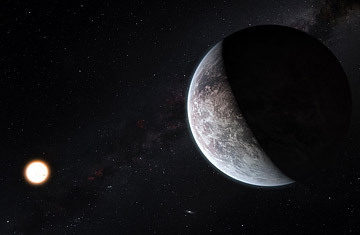 HARPS uses a telescope at the European Southern Observatory in Chile to look not for dimming, but for a star's slight wobble as the gravity of an orbiting planet tugs it first one way, then the other. The very first extrasolar planets were found this way, and the HARPS search is the most sensitive to date. That's especially important in the case of a world like 85512 b, which is only about 3.6 times more massive than the earth. In principle HARPS could find a world that's as small as just two earths  something the Europeans are actively pursuing. The problem for HARPS is that it can deduce only a planet's mass, not its size. You need both to calculate the density and thus figure out whether a world is made of rock or ice or gas. The Kepler mission has the opposite problem: it can measure a planet's size, by how much starlight it blocks, but not the mass. In a few cases, follow-up observations of Kepler planets with other telescopes have produced mass estimates and proved the existence of truly rocky planets (they're all too hot so far to sustain life). Unfortunately, 85512 b is in the southern sky, while Kepler looks only north, so it can't combine forces with HARPS on this one. But the HARPS team is building a second instrument that will be installed on a telescope in the Canary Islands in the next couple of years, making follow-up of Kepler planets  and getting a handle on what they're made of  much easier. With all of these ifs, 85512 b is still a very long shot for turning out to be the first known home for E.T. The fact that it's any sort of shot at all, however, shows just how far planet hunting has come. And given all the searches going on all over the world, with increasingly powerful technologies, it's clearly just the opening volley in what could be a series of extraordinary finds. Read about a recently discovered earthlike planet.